Also, please be aware that we do take reservations for private luncheons of 25-42 people and also on the following days: Valentine's Day, Easter, Mother's Day, Father's Day, and New Year's Eve. Good news for our handicapped customers! We now have handicap access to our Restaurant! Hopefully making your experience much easier and pleasant when coming over to have a meal. I would also like to remind everyone that coming up in January we are going to have our annual winter break where we are closed January 1st through 16th, and we will re-open January 17th at 4pm. Stay safe and warm up with our hot meals! Hello again everyone, just to reduce the confusion we will be closed until July 8th (7/8/15). Hello again everyone, in case you haven't already heard or found out somehow. We are closing our doors starting June 29th through July 8th. We will be re-opening on July 9th at 4pm. This is part of our yearly vacation set-up that was established awhile ago. Everyone can use a vacation sometime, and hopefully we can all be more relaxed and energized when we get back to serve you better. Hope everyone's doing well, see you at the restaurant when we're open. Hey again, seems our most recent poll has run out. This one was based on appetizers you prefer. 4% must have been lost in the decimals :P You can thank Google for that. Beyond that, we will be closed starting June 30th and we will re-open July 10th 4pm, so plan accordingly. I have also put up a new poll so you can participate in that. Keep cool everyone! Hello again, just a quick update on our poll results. 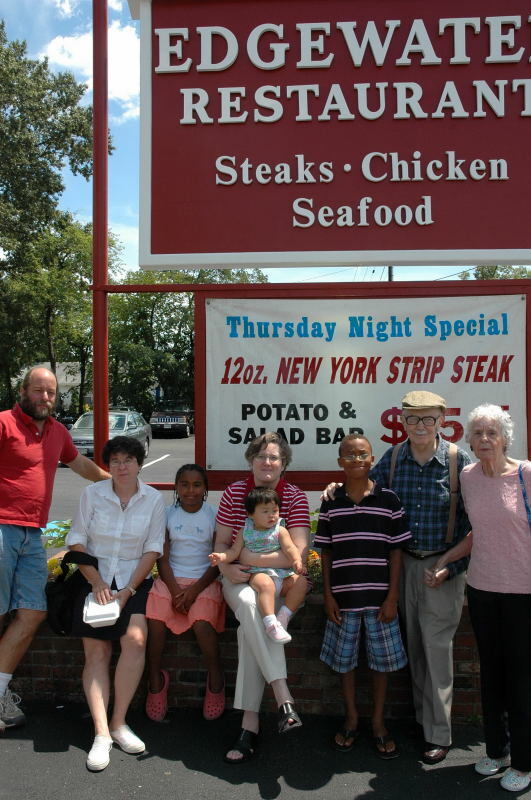 For the question: Would you recommend Edgewater Restaurant to friends? 50 of you (92%) said Sure! Hello all, just wanted to inform you that our Restaurant is taking a vacation for right now, we will be back and up and running on the 18th starting at 4pm. I hope you all enjoy the break and will come to see us when we re-open. Thank you! This delicious steak is always a treat and satisfying. Fresh, tender pork chops, lightly breaded and browned. Delicious fresh Maryland chicken, deep fried to a tender luscious golden brown. Tender and succulent and served with tomato sauce or brown gravy. Delicious lean ham, cooked with brown sugar and pineapple. Cold Water lobster tail and New York strip steak. Fresh, young veal covered with tomato sauce and topped with cheese. Three jumbo gulf shrimp, stuffed with a crabmeat mixture, according to Mrs. Sandvik's original recipe. Tender, succulent shrimp French fried to a golden brown. You'll enjoy the tender white meat of these rock lobster tails. Deliciously seasoned and prepared. Lightly fried for your pleasure. Caught from the deep, then crisply fried...delicious! Ocean-fresh scallops deep fried or broiled. Succulent jumbo lump crabmeat baked to the peak of perfection. We sell all menu and salad items to go. Ask your waitress. 18% gratuity will be added to parties 6 or more. $2.00 plate charge to share meals. Named for Anne Arundell, the daughter of Thomas Arundell, the first Barron Arundell of Wardour, member of the ancient family of Arundells in Cornwell, England. An original county in Maryland, created in 1650, the year after the death of Anne Arundell. Under Lord Baltimore's orders, Governor Stone's forces sailed up the Chesapeake Bay from St. Mary's City. The goal was to establish authority of the Calverts over Providence. The Puritans defeated the Governor's forces and gained temporary control of the colony. In 1688, Kind William III annulled the Calvert Charter and declared Maryland a royal colony. Renamed to "Annapolis" in 1695 in honor of the Princess Anne, daughter of Queen Mary. Annapolis became the political center of the colony and the seat of government when statehood was achieved on April 28,1788. Immediately following the Revolutionary War, Baltimore City with its superior port facilities became the economic center of the new state. The northern portion of the County began to develop an economy which was not based entirely on agriculture. Iron ore was mined, then smelted in Glen Burnie at the Curtis Creek Mining, Furnace and Manufacturing Company and at Elkridge Landing. The major cash crop of tobacco was lessening throughout the County during the nineteenth century, but it took the socioeconomic changes brought on by the Civil War to finally force local farmers to diversify. During the Civil War, both Annapolis and Baltimore were occupied by the Union Army. Camp Parole was established near Annapolis as a prisoner exchange post for soldiers waiting to be exchanged or paroled. Recreation became a major business during the late 1880s throughout the country. Numerous summer resorts including Bay Ridge, "The Queen Resort of the Chesapeake." Steamboat and rail access from Baltimore brought clientele to Bay Ridge and other smaller resorts developed on creeks in the northern portion of the County. Major Charles R. Douglass, the son of abolitionist Frederick Douglass, established Highland Beach as an exclusive resort for African Americans in 1893. Many prominent African Americans, including Booker T. Washington, Paul Laurence Dunbar and Mary Church Terrell, either visited or owned homes in the community. Increased industrialization in the County during World War II and the national movement towards suburban living that followed caused significant changes to occur in Anne Arundell County. Major employers such as National Plastics Corporation and Westinghouse relocated here. In 1845 on the site of Fort Severn, The Naval Academy was established and continues to be a major employer. Harundale Mall, one of the first enclosed shopping malls in the nation, was opened in 1958. Friendship International Airport (Baltimore-Washington International Airport), was dedicated in 1950 by President Harry S. Truman, was considered the most advanced facility in the United States. It was the East Coast terminus of the record-breaking transcontinental flight by the first Boeing 707 jetliner. 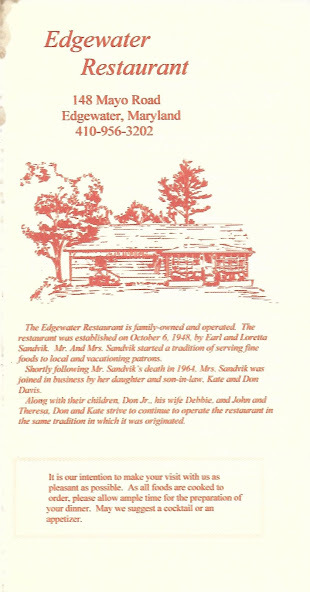 The staff at Edgewater Restaurant welcome you and we hope you enjoy your stay with us. Adapted from information obtained from the Chamber of Commerce.